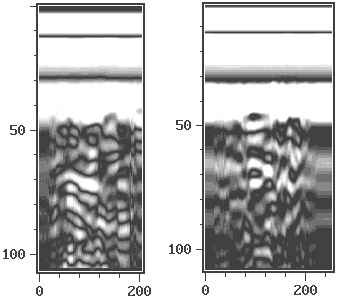 During the last few years ultrasonic testing procedures for concrete and concrete construction components using single-sided pulse-echo-techniques have made visible progress. The common work of a nation-wide usergroup in Germany[Ref. 2], applying tests to the same specimen, has especially spured improvements in the different testing-systems by comparison and the exchange of experience. It was an important result of the two testseries carried out since 1994 that the physically and technically different methods had specific advantages as well as limitations. Thus, the participating groups like ourselves, were able to concentrate the development of the used testsystem specifically on its recognized advantages. The technique of the testing-system used at the University of Dortmund is based on the fast transformation of gathered ultrasonic data from A-scans to online generated B-scans. Therefore it is a fast and in-situ utilizing procedure with no need for time-taking recalculations after the testing. As shown below (see Chapt. 3), it allows us instantly to identify positions or areas that are significant for the testing task. The results of the testing can be checked immediately. This paper reports experiences and developments gained on the testing-system NFUS2300 [Ref. 6]. It will show the advanced state of the used technique and present a successful in-situ testing. Today the application of US-Pulse-Echo-Technique is intensively used and proven on metal components. Due to the homogenious properties of metals, high ultrasonic frequencies (> 1MHz) can be applied. In most cases a visualisation of the data with A-scans on an oscilloscope is valid to reliably find defects, cracks etc.. Since concrete is a quite inhomgenious substance (aggregates, hardened cement paste, air voids), the US-frequencies used here have to be reduced to at least 250kHz [Ref. 7], and partly intense scattering or reflecting will appear in the recieved ultrasonic signals. This causes the direct displaying of A-scans with a visual evaluation by the tester to be of little significance. New measuring- and data-evaluation-procedures were needed to place additional information at the testers disposal. The testing-system used here allows computer-aided monitoring of the data in a B-scan. This method of displaying the data makes it most comfortable for the tester to evaluate large numbers of single measurements (´shots´) at a glance. Moving the transducer along the concrete surface one is able to directly compare the data from different positions simultaneously recieving information on intensity and phases of the signal and their relative changes. A Pentium-PC, included in the testing-system, visualizes the B-scans with indicated colours or grayscale by running a specially developed online-imaging software (Fig. 1). This computer imaging turns out to be very effectiv for the localisation of defects or backwall-echos not detected in the A-scan. In the online display, relative deviations in the specimen are indicated and can be recognized quite easily. Therefore, a previously coarse localisation e.g. of a defect, more complete views of the area can follow. The tests may be documented in the future by saving the scans, with an additional text record, to disc or color printer. A further shaping of the measured signal becomes necessary due to the heterogene structure of the concrete. A reduction of the data-flow is neccessary to substantially ease the evaluation. For this purpose, a low-pass filter cuts down the measured signal to the frequencies significant for longitudinal modes in the concrete. Former researches pointed out optimal results around 100kHz [Ref. 3-5]. Consequently, the testing-system can be switched to perform low-pass filtering at different cut-off frequencies. The adjusted optimum frequency is most dependent on the maximum aggregate built in the specimen. With intent to suppress excessiv scattering, lower cut-off frequencies must be used at larger aggregate sizes (putting up with a minor resolution [Ref. 1]). This adjustment and all further functions are completely controlled by the integrated PC (Fig. 2). Due to the high absorption of the ultrasound in the concrete and the geometrical divergence resulting from the spherical shape of the ultrasonic field [Ref. 7], it is advantageous to implement an adjustable gain control with optional apertures over the time of flight. This enables us to analyse echo signals out of different depths at equal levels. With this procedure it becomes possible to detect both an echo of a defect and the backwall in one scan. The amplification-curve can optionally be programmed free by the tester in respect to the physical demands. The quality and significance of a measurement substantially depends on the system transducer / specimen. The applied transducer needs to have a high, optimal to the concrete adapted attenuation to ensure both a maximum sound-input into the concrete and a minimum relaxation time (dead time) of the transducer after excitation. Components used here are available today, so that the Pulse-Echo-Technique of testing concrete comes closer to practical use. Besides a further development of the transducers a further optimazation can be achieved by using different coupling-means depending on the testing conditions and additional shaping of the excitation pulse in relation to its frequency range and energy. At the testing-system this is realized by a free adjustability of the duration of the excitation pulse from 0.1 to 20µs (el.). As a rule this optimazation has to be repeated for every new, specific testing arrangement (transducer/coupling means/concrete), but it is executable within a few moments via the PC. Additonally, slight differences between identically designed transducers can occur and should be considered. In addition to these technical advancements the testing-system was miniaturized and mostly integrated during the last few years. This improved the handling in-situ distinctly. The visualisation is now performed by a flat-screen TFT-display, and the keyboard can be fixed as part of the device (Fig. 3). In 1997 a fly-ash storage silo (Fig. 4) at a German power-plant was damaged by a pressure-overload during filling. The silo was built in 1974 as a slipform concrete construction. In accordance to the newest technology of the times the built-in sliding ducts had not been filled with mortar or cement paste during construction. For the repair it was necessary to inject these ducts with cement paste. For injection and ventilation it became necessary to drill holes at both ends of the ducts. It was not possible to relocate the number and positions of the ducts from the construction drawings (Fig. 7). Due to the outer circumference of the silo, about 25 meters, a non- or rarely destructive testing method was needed for the localization. Because the building was still in use, it was only accessable from the exterior side. We chose the ultrasonic pulse-echo-technique as an appropriate way of doing the testing. As reported before [Ref. 1], there are some essential parameters that influence the results of the testing, such as the thickness of the expired specimen, the quality and coarse grain of the built-in concrete, and the properties of the specimen-surface for the transducer´s coupling. At the onset of testings none of these parameters were available. As a result, we had to carry out preliminary investigations in order to prove the applicability of our testing-technique "in situ". The first visual inspection of the silo showed a large number of fine cracks especially in the middle loading area of the silo. This could worsen the ultrasonic results considerably. At the top area of the silo only a few cracks were observed, therefore testing at this site was given the best chance. Furthermore, the inspection showed that the surface of the building was coated with a quite granulated and sandy finish which would prevent the ultrasonic transducer from coupling reliably to the concrete. Since good coupling is one of the main parameters in assuring a good testingresult, the surface was needed to be prepared by grinding it with an abrasive tape grinder. By request of the owner, two concrete test cores (Ø 15cm) were drilled out of the building. The wall thickness was determined at 25cm, with the maximum aggregate size being about 32mm. Accidentially, one of the drills (core B2, Fig. 6) hit a duct. The depth of the duct was 15cm with a diameter of 3cm. According to these parameters and the geometry, which former studies [Ref. 1] concluded, the dectection of a defect (here: the duct) under these conditions would be possible if at least one dimension of the defect exceeds 4cm. Since the duct´s diameter was only 3cm, whereas the parameter of the testing-system was 4cm, possibly more than one drill would be needed to hit a duct. Therefore we proposed, that if the duct was not instantly hit, two more drillings with a horizontal distance of 2,5cm left and right to the measured position should be made. This insured striking the duct. 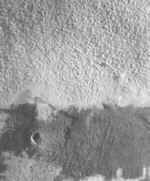 At core B2 a transverse crack going through from the surface down to the duct was found, as well as some weak reinforcement bars. Because both the crack and the bars could worsen the ultrasonic results by sound-scattering and -reflecting, it wasn´t certain that a successful testing could be done. To gather more information, the core B2 was additionally tested in the laboratory. After smoothening the rough surface of the core by grinding, it turned out to be possible to detect a weak, but significant echo-signal from the duct. Consequently it was jugded positive to locate the ducts "in situ" at least in the areas with slight cracking, and not to close to weak reinforcement. According to these preliminary testings, we proposed the following procedure. Because there was only slight cracking at the upper section of the silo (marked in Fig. 7), it would be most promising to start the testing there. In the case of dectecting significant echos from a duct, we would drill directly into the building on trial to test the result. Furthermore, it was assumed that the ducts would lie completely vertically. Because there was a poor chance of the ultrasound-testing beeing successful at the lower, extremly cracked injection area, it was proposed to localize the ducts there by connecting the positions found in the upper section vertically down to the lower section with a vertical lead line (distance ca. 15m). After marking the measured position of the ducts, they should be found by drilling on trial there as well. In the same way, the holes for the ventilation during injection, at the top of the building should be drilled. After scaffolding the building was completely accessable from the outside. As proposed, we started the testing in the upper section. Due to the worsening influence of weak reinforcment bars on the ultrasound-signal, we first specified the testing section using a reinforcement-finder to avoid measuring above the bars. Secondly, the surface was prepared by grinding it to perform a good coupling of the transducer. The coupling agent was glycerine. Fortunatly the drill core B2 struck a duct, so that a position to start the testing was given. Because the distance between the borrow-site of core B2 and the testing section was about 8m, it would give a first hint, if the ducts were really vertically built in as we assumed. 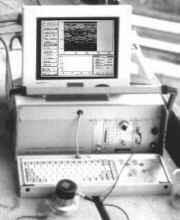 The ultrasound-testing-system was adjusted to the parameters found in the laboratory at core B2 (low-pass-filtering at 50 kHz, relatively high pulse-power at 6µs pulse-width). The B-Scan showed a clear response-signal; this position was marked and instantly drilled. The depth of the drilling was limited to 16cm to avoid penetration of the silo-wall. The duct was struck directly at a depth of about 15cm. It could be proved, that at least this duct was positioned absolutly vertically in the building. The second main testing task was to localize the position of the next duct and to establish a, more than likely regular, grid. After consulting the owner´s engineers it could only be estimated, that the grid would be between 1 - 4m. We then conducted a continious scan over a full length of 4m. Weak echo-signals were detected 1,20m from the first duct, but the drilling only hit a reinforcement bar, which had not been found before. In a distance of 1,80m a slight, but significant signal was found and in 3,60m distance a clear and significant echo appeared. Both positions were then drilled. While the drilling at d= 3,60m directly hit the duct, the drilling at d= 1,80m initially failed, although two further attempts with a horizontal shift of 2,5cm (see above) were made. Subsequently, we suspected the duct´s grid system to be positioned at 3,60m. We, therefore, concentrated our tests on these areas. At all new positions tested clear echo-signals were found (see Scans in Fig. 8). This resulted in 7 ducts localized around the circumference. In most cases the drilling instantly hit the ducts, henceforth all ducts were found. Since the grid of 3,60m seemed to be quite large and since we had recieved a weaker echo-signal between the ducts 1 and 2 (d= 1,80m; see Fig. 7) the position 2A was once more examined by drilling in horizontal steps of 2,5cm. The drillings turned out to be not deep enough, therefore the duct was not hit in the first testing-series, although we knew it had to be there. We concluded in hitting the duct at this medium-position, too. Thus, the real grid of the ducts was 1,80m and the total number of ducts found resulted 14. This number of ducts and their regular arrangement around the circumference of the silo seemed to be reasonable from the engineering standpoint. Consequently, it seems safe to assume that all ducts have been found by the testing. The following work of drilling the final holes for the injection and ventilation was carried out by manual labours according to the orders described above. The owner returned a positive result for this operation, especially the orientation of the ducts in the building being absolutly vertical, henceforth the proposed procedure succeeded. The testing presented above demonstrates that the single-sided ultrasonic pulse-echo-technique has the capability to become a reliable application for testing concrete as well. Especially in the case shown, no alternative NDT-technique seemed to be applicable. Since the modern sophisticated computer-technologies are rapidly advancing, there is some space left for further improvements e.g. on the computation of scans. Enhanced transducer-technologies are presently being developed and will increase the significance of the ultrasonic signals. On the other hand it is unneglectable that the experience of the testing personnel is still one of the main influences on a good testing result. Secondly there seem to be only physical limitations for pulse-echo-methods to succeed in the testing of concrete, e.g. the increased scattering of the sound-signal with greater depth of intrusion as well as very tight built-in reinforcement. 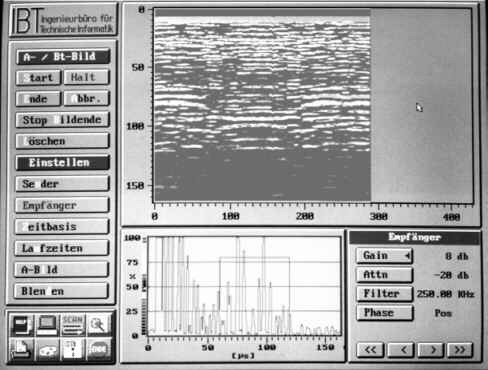 Being applied to an appropriate testing task, the ultrasonic pulse-echo-technique can achieve reliable results as shown above.